Portuguese convert; lived at the end of the fifteenth century; notorious for his hostility to his former coreligionists. According to Abraham b. Solomon of Torrutiel (Neubauer, "M. J. C." i. 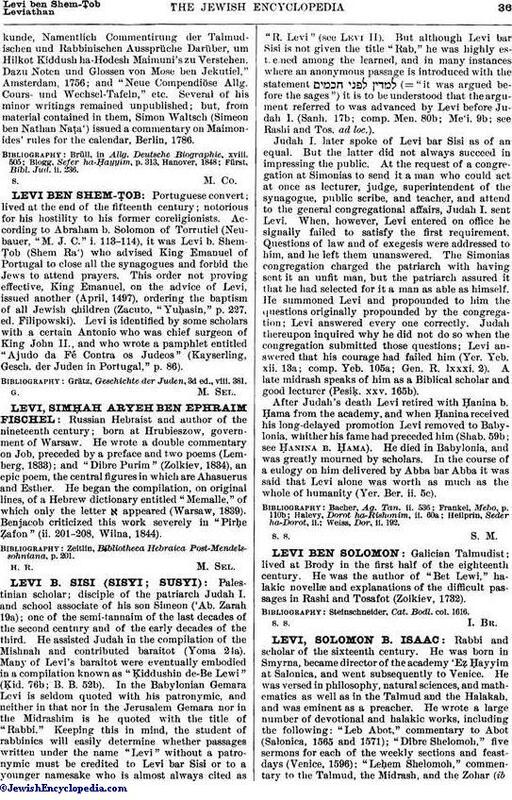 113-114), it was Levi b. ShemṬob (Shem Ra') who advised King Emanuel of Portugal to close all the synagogues and forbid the Jews to attend prayers. This order not proving effective, King Emanuel, on the advice of Levi, issued another (April, 1497), ordering the baptism of all Jewish children (Zacuto, "Yuḥasin," p. 227, ed. Filipowski). Levi is identified by some scholars with a certain Antonio who was chief surgeon of King John II., and who wrote a pamphlet entitled "Ajudo da Fé Contra os Judeos" (Kayserling, Gesch. der Juden in Portugal," p. 86). Grätz, Geschichte der Juden, 3d ed., viii. 381.